An al Qaida-linked Islamist group has claimed responsibility for an attack that killed 10 UN peacekeepers from Chad in the north of Mali on Sunday. In a statement posted on messaging platform Telegram, the Nusrat al-Islam wal Muslimeen group said the attack was a response to Chadian President Idriss Deby's revival of diplomatic relations with Israel. "MINUSMA forces responded robustly and a number of assailants were killed," UN spokesman Stephane Dujarric said without specifying the toll. The attack "illustrates the determination of the terrorists to sow chaos. It demands a robust, immediate and concerted response from all forces to destroy the peril of terrorism in the Sahel," Mahamat Saleh Annadif added. 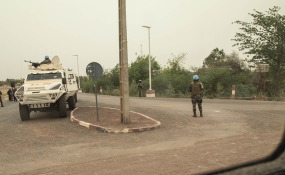 Some 13,000 peacekeepers are deployed in Mali as part of the UN mission, which was established after Islamist militias seized the north of the country in 2012. They were pushed back by French troops in 2013.